One of the challenges facing businesses today is integrating their enterprise business systems. Often these businesses have a significant investment in a range of custom and packaged business applications. Each of these applications is different and most likely were not designed to interact with other applications (creating what is known as information silos). These information silos result in disparate systems where information becomes trapped in incompatible data formats, rendering this valuable information useless or, at a minimum, difficult to use or exchange between applications. Instead of occupying your IT organization with the task of creating specialized programs, IBM® WebSphere® Transformation Extender can simplify and automate this entire process. WebSphere Transformation Extender provides universal access or universal integration between systems. With WebSphere Transformation Extender, organizations can transform information from many different disparate systems into a common format. WebSphere Transformation Extender provides data or information that can be more effectively analyzed and used for a greater purpose or that can be transformed directly into any target format. 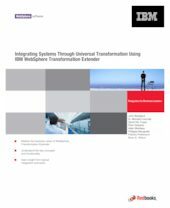 This IBM Redguide™ publication shows how IBM WebSphere Transformation Extender V8.2 can help you solve application integration problems. This guide also shows where WebSphere Transformation Extender can add value to your application integration needs. We discuss the basic concepts and methods of execution. We also illustrate three sample scenarios that show how WebSphere Transformation Extender can integrate applications within an existing business environment. These scenarios and this guide can help you to understand the product framework as you get started on application integration.